Contributor Steve Bleecker assures us that “No one else has this”! One listen to this nine minute scope of the Big 68 and you’ll be instantly teleported into radio heaven. That is, if you were a fan of mid-1970s RKO General stations. This is almost a *perfect* recording which has held up well for nearly 40 years to land here at Airchexx.com for public exhibit. This begins right where each weekday would have in Boston, with Dale Dorman in the morning drive chair. Dale is upbeat and silly on this particular day… and boy does he sound YOUNG here. Yes, that makes a difference to some of us old guys. Then, this blows on through the rest of the broadcast day, with Johnny Dark, Jack O’Brien, the GREAT Harry Nelson, ‘Exciting’ Mike Addams, J.J. Wright and ending with Eric Chase. Every one of the jocks on this composite were great in their own right and were all known at other stations both in Boston and elsewhere. Some examples include Harry Nelson, who was famous at KFRC San Francisco and at WJBQ Portland Maine, Johnny Dark, who spent time at WNBC New York, Mike Addams, known for a time in Springfield Mass at WAQY, J.J. Wright who was very well known in Boston not only at WRKO, but for a long while at WXKS-FM “Kiss 108” and the former 103.3 WODS. Eric Chase? He also spent time in San Francisco at KFRC and probably some other places. While we think this is just TOO short, we’re also very grateful to Contributor Steve Bleecker just for sending in a ‘virgin’ aircheck from one of America’s greatest AM Top 40 stations, 68 WRKO. My EXTREME Thanks to Larry White for sending this to me just the other Day ! What a Gem…and what a Surprise…I thought I had lost this aircheck…BUT…I forgot…I gave it to Larry, my WAXC Program Director, all those years ago ! John Sherman…Good Friend to Harry Nelson, and Dale’s Board Op. at RKO Jetted this to me…from Boston to Rochester…as it was then Just “Hot off the Presses”! Thank You John Sherman, wherever you are ! Miss you ! This was recorded while I was programming WMEX. 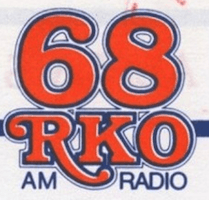 Mel Phillips was programming WRKO. It was pretty tough competition. Mel later became my PD while I was on the air at WNBC. Very much to his credit, our relationship was both warm and professional. I’ve often wondered just what WMEX sounded like during that timeframe. I didn’t know you programmed WMEX in 1974, and I never really knew what became of you after WBZ until I heard the WYNY recordings. All I remember was you on WBZ – and I was REAL young back then… and then “Calling All Sports” with Guy Manella in the evenings. You have to remember, the radio was always on. My mother, apparently, was bigtime into radio, she remembered (because she told me) Juicy Brucie Bradley, and told me about all the great Deejays. She’s the one who sparked my interest. She LOVED you, I can tell you that! Anyway, off topic, but I sure would love to hear what your brand of WMEX sounded like. Mike Addams also worked at WQXI 790 in Atlanta on weekends in 1968-1969. Did Mel Phillips arrive at WRKO after Gerry Peterson’s tenyur? I recall reading in John Long’s excellent memoir, “Puttin’ On The Hits”, that Paul Drew asked Gerry to come to KHJ early in 1974, and that Paul Kirby was named PD at WRKO after his departure. Mel Phillips was P.D. before Gerry Peterson. @Donavan, check out this website for the tenures of the various WRKO PDs. Also, that was NOT the same Eric Chase who worked at KFRC. Actually, that Eric Chase, who also used the names Harry Miller, Paul Christy, Paul Steljes to name a few was on air at the Big 610 in SF at the time of this aircheck.